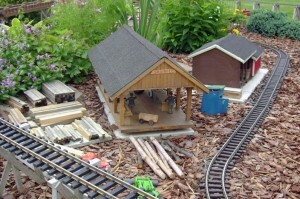 Last week, we introduced you to model railways for the garden. 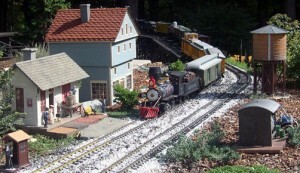 To see one in person, check out the exhibit by the Western New York Garden Railway Society at the Buffalo and Erie County Botanical Gardens, 2655 South Park Ave., Buffalo. The exhibit is running now through Jan. 2. 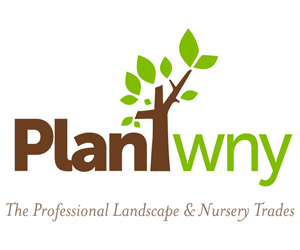 Today we’ll talk about the gardening aspects of the hobby. 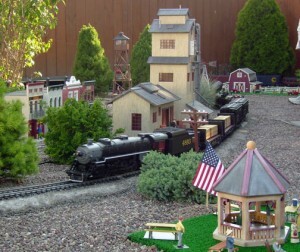 When choosing plants for your garden railway, you want to look for ones that you can keep small to stay in scale with the trains, said Gary Tebo of West Seneca, secretary of the Western New York Garden Railway Society. He uses a lot of thyme, which has small leaves and fits in well. Tebo also likes stonecrop because it grows in crevices and gets a pink flower. Sedum can grow upright or as a ground cover, and it comes in many sizes. In the photo at left, the sedum in the upper left looks treelike. Two varieties of hosta are also pictured. 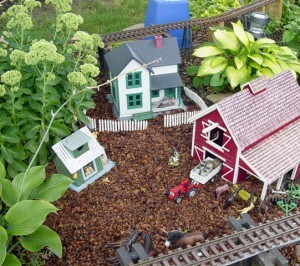 While Gary does the gardening around the train layout, his wife Nancy does the gardening in the rest of the yard. The Tebos use evergreens inside and outside the layout, though they have to be careful which evergreens they choose because the deer that will eat them. They have one arborvitae, which somehow survived even though it’s a favorite of the deer. Boxwood and pyracantha are two evergreens that the deer won’t bother. Tebo also has a honoki cypress, which stays small and has a nice branch formation, as well as a low-growing juniper. The members of the Western New York Garden Railway Society are happy to help anyone interested in the hobby. The group, which organized in 2002, meets at Ebenezer United Church of Christ, 630 Main St., West Seneca. 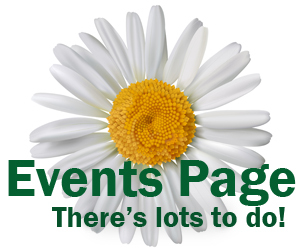 Meeting dates are on the society’s web site. A video of garden railways is also available from the group. The railway exhibit will run until Sunday, Jan. 2. Hours are 10 a.m. to 5 p.m. The Botanical Gardens will close at noon on Christmas Eve and be closed Christmas Day. 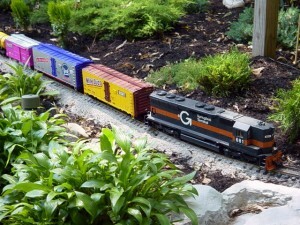 I would like to use some of your photos and information on a sign to promote the garden train at the botanical gardens. The sign will appear near the guest book at our Rail Barons exhibit in the Buffalo and Erie County Historical Society. That’s great! I’ll contact you via e-mail.